Today’s turning out to be a difficult day for content creation. I’ve trawled through my ‘bag of bits’ and found nothing I feel like posting. I’ve searched for inspiration within and outside myself and still feel uninspired. This lack of enthusiasm is partly the result of knowing that very few people are seeing, let alone reading my posts. Yet, I started doing this because it was a fun idea, not for any particular outcome. I’m being confronted by that old distractor of wanting to know something that I can’t see currently, or wanting to know that this is worth it. Nothing outside me can tell me it’s worth it though. Only I can decide that. Often we wait to know if we’re doing the right thing or moving in the right direction and then we become stuck and stagnant waiting for a sign. Even though we’ve already had the impulse we wait for something out there to tell us we’re on the right track. In this case my motivation is being sapped by some unhelpful thinking about how it’s only worth doing if some arbitrary number of people are reading my writing. The trick is to keep moving, writing something everyday, for as long as the impulse to do so is there, letting go of who should be reading, what they should be thinking, what I should be writing, where I should be posting, when I should be posting etc. etc. Rather than waiting for something outside us to show us we’re going the right way, we can set off in the general direction and just keep taking the next step we are able to see. Doing that we open ourselves up to discovering something, at the next junction, that isn’t available to us where we are now. Numbers 10 and 11 of 366 book bits weren’t long enough to warrant a whole blog post so I made them comments on FB. Advice from an Unenlightened one: keep at it! Don’t worry who is looking, or how many. …. is to me spot on. In same way as planning one’s life is more often than not a futile exercise – better to have a few good ideas up one’s sleeve, and use them to decide which opportunities to follow up…. I’m reading your posts. Hadn’t thought to give you feedback, just thought uh huh, yep, ‘strue etc. Thank you for this wonderful piece. It reminded me of Napoleon Hill’s saying “Don’t wait. 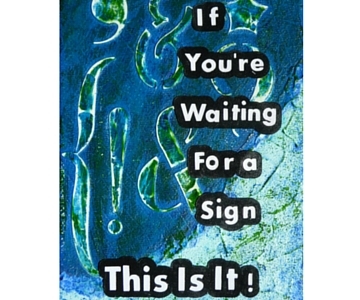 The time will never be just right.”We must never wait for a sign when the ambition has already been kindled from within. I’m currently going through a writer’s block and your article was a great inspiration.